Grilled Trout, Barbecued Pork Loin, are some of the main courses this week. The poussin that we get are very young chickens and weigh about 18oz (550gr) each. They are perfect individual servings (with maybe a snack leftover). If you get larger birds one may be enough; you could cut it in half before cooking, if you like. 2 Cornish game hens or poussin (little chickens), depending on size. 1 cup ice cubes app. At least 2 hours and up to 7 hours before cooking, mix water, salt, sugar and vinegar in a deep bowl. Stir until sugar and salt are dissolved. Peel garlic and smash with the flat of the knife. Add garlic, bay leaves and juniper berries (if using). 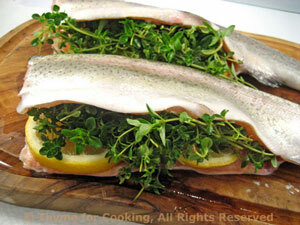 Cover and refrigerate, turning occasionally, until ready to cook. Remove chicken and allow to air dry for 15 minutes (or up to 30). Mix olive oil and lemon juice. Cook hens on barbecue grill over indirect heat (either charcoal or gas), covered, for 45 - 60 minutes, depending on size, or until done. Start basting after about 15 minutes and baste 2 or 3 times. Poultry is done at 160 F (70C) on your meat thermometer and/or the juices run clear when pierced with knife. The legs will also wiggle freely and the hens will be a lovely golden brown. Or they can be baked in a shallow roasting pan in a 400F oven for 45 - 60 minutes, until done. If baking, start basting immediately. The Grill Expert came up with the idea of having a very thin basting sauce to keep the pork moist... It worked. The pork is enough for 2 meals. Mix chili powder and garlic. Cook pork loin on barbecue grill, over indirect heat with the cover closed. Pork is done when it reaches an internal temperature of 145F (62C) Use an instant read or a remote meat thermometer for best results. If you don't have either, take the roast off and slice into it after 40 - 50 minutes (depending on weight and shape) to test. It should be almost cooked through with a bit of pale pink in the center. Mix coffee, soy sauce and red wine vinegar. Spoon sauce over pork every 8 - 10 minutes starting immediately. In a small bowl whisk together all ingredients for Barbecue Sauce. Baste pork with 3 tbs barbecue sauce after 40 minutes. Serve the rest on the side. When pork is done, remove, cover with foil and let rest for 5 minutes. Slice and serve, barbecue sauce on the side. Could also be roasted in a 400F (200C) oven for about the same amount of time. You can use bottled Sweet and Sour Sauce or my recipe - which makes just the right amount. I usually use mushrooms raw in salads, but sometimes, as here, they are sautéed to absorb and blend the flavors. Pour 2 tbs Teriyaki sauce over chicken and allow to marinated a few minutes. Clean and thickly slice mushrooms. In nonstick skillet heat oil and 1 tbs Teriyaki sauce. When hot add mushrooms, pepper and sauté briefly, about 4 minutes. Remove and set aside. 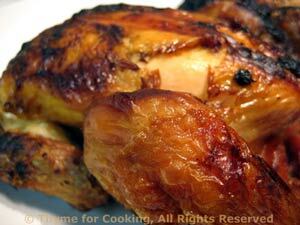 Cook chicken on barbecue grill over direct heat for 8 - 10 minutes per side. When done remove and slice. Or: cut into strips before marinating, toss with Teriyaki sauce and stir-fry in nonstick skillet in 1 tbs oil for 4 - 5 minutes. In a small saucepan, heat sugar, vinegar, soy sauce and cornstarch to boiling, stirring with a whisk. Prepare lettuce and put into a large salad bowl along with chives. Toss with about half of the vinaigrette - it's quite thick so it takes a bit of tossing to distribute it well - be careful not to use too much to start. When it is to your liking, add mushrooms, peppers and toss gently. Arrange chicken on top. 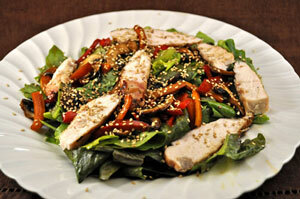 Drizzle with a bit of vinaigrette, sprinkle with sesame seeds, and serve with remaining vinaigrette on the side. Note: Toast sesame seeds in a dry, nonstick skillet, over medium-high heat, 3 - 6 minutes. Start flipping them or shaking the skillet after 1 - 2 minutes and remove as soon as light brown. The cheese and tomato are on the inside. The cheese melts (barely) but the tomato stays firm. Serve with or without buns. Cut 4 slices of tomato. Divide meat into 8 portions. Shape 4 thin patties about the size of the tomato slices. 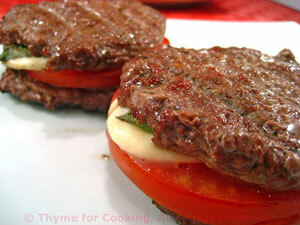 Place 1 tomato slice, 1 slice of mozzarella and 1 or 2 basil leaves on each patty. Shape 4 more thin patties and place on top. Oil hinged basket. Place patties in basket and secure. Cook on barbecue grill over direct heat for 3 - 4 minutes per side. 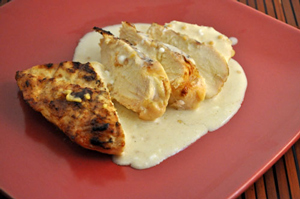 Grilled chicken breasts finished with a warm mustard sauce; a little bit of heat for summer cooking. 1 tbs Dijon-style mustard - yes, another tbs. Combine stock, sherry in a small saucepan and bring to a boil over medium-high heat. Continue to boil until reduced to about 1/3 cup. Whisk in mustards, reduce heat and simmer 2 minutes. Mix 1 tbs Dijon mustard with 1 tbs olive oil and spread on chicken breasts. Cook on barbecue grill for 10 - 15 minutes or until done. Remove from heat, slice and serve with sauce. 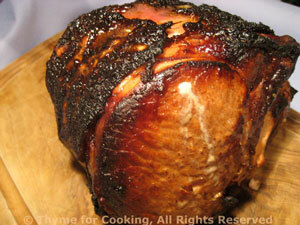 Or can be baked for 20 - 25 minutes 400F or sauté for 15 - 20 minutes - in all cases until done.